Adult non-Hodgkin lymphoma is a disease in which malignant (cancer) cells form in the lymph system. Non-Hodgkin lymphoma is a type of cancer that forms in the lymph system. The lymph system is part of the immune system. It helps protect the body from infection and disease. B lymphocytes that make antibodies to help fight infection. Also called B cells. Most types of non-Hodgkin lymphoma begin in B lymphocytes. T lymphocytes that help B lymphocytes make the antibodies that help fight infection. Also called T cells. Natural killer cells that attack cancer cells and viruses. Also called NK cells. Lymph tissue is also found in other parts of the body such as the stomach, thyroid gland, brain, and skin. Cancer can spread to the liver and lungs. Non-Hodgkin lymphoma during pregnancy is rare. Non-Hodgkin lymphoma in pregnant women is the same as the disease in nonpregnant women of childbearing age. However, treatment is different for pregnant women. This summary includes information on the treatment of non-Hodgkin lymphoma during pregnancy (see the Treatment Options for Non-Hodgkin Lymphoma During Pregnancy section for more information). The major types of lymphoma are Hodgkin lymphoma and non-Hodgkin lymphoma. Lymphomas are divided into two general types: Hodgkin lymphoma and non-Hodgkin lymphoma. This summary is about the treatment of adult non-Hodgkin lymphoma. Non-Hodgkin lymphoma can be indolent or aggressive. Non-Hodgkin lymphoma grows and spreads at different rates and can be indolent or aggressive. Indolent lymphoma tends to grow and spread slowly, and has few signs and symptoms. Aggressive lymphoma grows and spreads quickly, and has signs and symptoms that can be severe. The treatments for indolent and aggressive lymphoma are different. Follicular lymphoma. Follicular lymphoma is the most common type of indolent non-Hodgkin lymphoma. It is a very slow-growing type of non-Hodgkin lymphoma that begins in B lymphocytes. It affects the lymph nodes and may spread to the bone marrow or spleen. Most patients with follicular lymphoma are age 50 years and older when they are diagnosed. Follicular lymphoma may go away without treatment. The patient is closely watched for signs or symptoms that the disease has come back. Treatment is needed if signs or symptoms occur after the cancer disappeared or after initial cancer treatment. Sometimes follicular lymphoma can become a more aggressive type of lymphoma, such as diffuse large B-cell lymphoma. Lymphoplasmacytic lymphoma. In most cases of lymphoplasmacytic lymphoma, B lymphocytes that are turning into plasma cells make large amounts of a protein called monoclonal immunoglobulin M (IgM) antibody. High levels of IgM antibody in the blood cause the blood plasma to thicken. This may cause signs or symptoms such as trouble seeing or hearing, heart problems, shortness of breath, headache, dizziness, and numbness or tingling of the hands and feet. Sometimes there are no signs or symptoms of lymphoplasmacytic lymphoma. It may be found when a blood test is done for another reason. 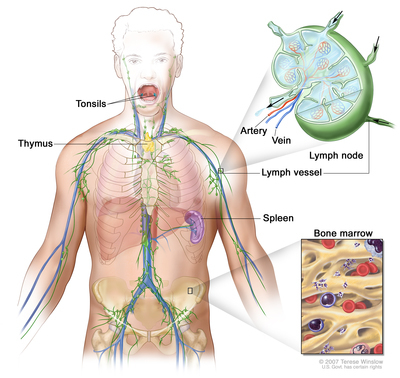 Lymphoplasmacytic lymphoma often spreads to the bone marrow, lymph nodes, and spleen. It is also called Waldenström macroglobulinemia. Nodal marginal zone lymphoma. Nodal marginal zone lymphoma forms in lymph nodes. This type of non-Hodgkin lymphoma is rare. It is also called monocytoid B-cell lymphoma. Gastric mucosa-associated lymphoid tissue (MALT) lymphoma. Gastric MALT lymphoma usually begins in the stomach. This type of marginal zone lymphoma forms in cells in the mucosa that help make antibodies. Patients with gastric MALT lymphoma may also have Helicobacter gastritis or an autoimmune disease, such as Hashimoto thyroiditis or Sjögren syndrome. Extragastric MALT lymphoma. Extragastric MALT lymphoma begins outside of the stomach in almost every part of the body including other parts of the gastrointestinal tract, salivary glands, thyroid, lung, skin, and around the eye. This type of marginal zone lymphoma forms in cells in the mucosa that help make antibodies. Extragastric MALT lymphoma may come back many years after treatment. Mediterranean abdominal lymphoma. This is a type of MALT lymphoma that occurs in young adults in eastern Mediterranean countries. It often forms in the abdomen and patients may also be infected with bacteria called Campylobacter jejuni. This type of lymphoma is also called immunoproliferative small intestinal disease. Splenic marginal zone lymphoma. This type of marginal zone lymphoma begins in the spleen and may spread to the peripheral blood and bone marrow. The most common sign of this type of splenic marginal zone lymphoma is a spleen that is larger than normal. Primary cutaneous anaplastic large cell lymphoma. This type of non-Hodgkin lymphoma is in the skin only. It can be a benign (not cancer) nodule that may go away on its own or it can spread to many places on the skin and need treatment. Diffuse large B-cell lymphoma. Diffuse large B-cell lymphoma is the most common type of non-Hodgkin lymphoma. It grows quickly in the lymph nodes and often the spleen, liver, bone marrow, or other organs are also affected. Signs and symptoms of diffuse large B-cell lymphoma may include fever, recurring night sweats, and weight loss. These are also called B symptoms. Primary mediastinal large B-cell lymphoma is a type of diffuse large B-cell lymphoma. Primary mediastinal large B-cell lymphoma. This type of non-Hodgkin lymphoma is marked by the overgrowth of fibrous (scar-like) lymph tissue. A tumor most often forms behind the breastbone. It may press on the airways and cause coughing and trouble breathing. Most patients with primary mediastinal large B-cell lymphoma are women who are age 30 to 40 years. Follicular large cell lymphoma, stage III. Follicular large cell lymphoma, stage III, is a very rare type of non-Hodgkin lymphoma. It is more like diffuse large B-cell lymphoma than other types of follicular lymphoma. Anaplastic large cell lymphoma. Anaplastic large cell lymphoma is a type of non-Hodgkin lymphoma that usually begins in T lymphocytes. The cancer cells also have a marker called CD30 on the surface of the cell. Cutaneous anaplastic large cell lymphoma. This type of anaplastic large cell lymphoma mostly affects the skin, but other parts of the body may also be affected. Signs of cutaneous anaplastic large cell lymphoma include one or more bumps or ulcers on the skin. Extranodal NK-/T-cell lymphoma. Extranodal NK-/T-cell lymphoma usually begins in the area around the nose. It may also affect the paranasal sinus (hollow spaces in the bones around the nose), roof of the mouth, trachea, skin, stomach, and intestines. Most cases of extranodal NK-/T-cell lymphoma have Epstein-Barr virus in the tumor cells. Sometimes hemophagocytic syndrome occurs (a serious condition in which there are too many active histiocytes and T cells that cause severe inflammation in the body). Treatment to suppress the immune system is needed. This type of non-Hodgkin lymphoma is not common in the United States. Lymphomatoid granulomatosis. Lymphomatoid granulomatosis mostly affects the lungs. It may also affect the paranasal sinuses (hollow spaces in the bones around the nose), skin, kidneys, and central nervous system. In lymphomatoid granulomatosis, cancer invades the blood vessels and kills tissue. Because the cancer may spread to the brain, intrathecal chemotherapy or radiation therapy to the brain is given. Angioimmunoblastic T-cell lymphoma. This type of non-Hodgkin lymphoma begins in T cells. Swollen lymph nodes are a common sign. Other signs may include a skin rash, fever, weight loss, or night sweats. There may also be high levels of gamma globulin (antibodies) in the blood. Patients may also have opportunistic infections because their immune systems are weakened. Hepatosplenic T-cell lymphoma. This is an uncommon type of peripheral T-cell lymphoma that occurs mostly in young men. It begins in the liver and spleen and the cancer cells also have a T-cell receptor called gamma/delta on the surface of the cell. Subcutaneous panniculitis-like T-cell lymphoma. Subcutaneous panniculitis-like T-cell lymphoma begins in the skin or mucosa. It may occur with hemophagocytic syndrome (a serious condition in which there are too many active histiocytes and T cells that cause severe inflammation in the body). Treatment to suppress the immune system is needed. Enteropathy-type intestinal T-cell lymphoma. This type of peripheral T-cell lymphoma occurs in the small bowel of patients with untreated celiac disease (an immune response to gluten that causes malnutrition). Patients who are diagnosed with celiac disease in childhood and stay on a gluten-free diet rarely develop enteropathy-type intestinal T-cell lymphoma. Intravascular large B-cell lymphoma. This type of non-Hodgkin lymphoma affects blood vessels, especially the small blood vessels in the brain, kidney, lung, and skin. Signs and symptoms of intravascular large B-cell lymphoma are caused by blocked blood vessels. It is also called intravascular lymphomatosis. Burkitt lymphoma. Burkitt lymphoma is a type of B-cell non-Hodgkin lymphoma that grows and spreads very quickly. It may affect the jaw, bones of the face, bowel, kidneys, ovaries, or other organs. There are three main types of Burkitt lymphoma (endemic, sporadic, and immunodeficiency related). Endemic Burkitt lymphoma commonly occurs in Africa and is linked to the Epstein-Barr virus, and sporadic Burkitt lymphoma occurs throughout the world. Immunodeficiency-related Burkitt lymphoma is most often seen in patients who have AIDS. Burkitt lymphoma may spread to the brain and spinal cord and treatment to prevent its spread may be given. Burkitt lymphoma occurs most often in children and young adults (See the PDQ summary on Childhood Non-Hodgkin Lymphoma Treatment for more information.) Burkitt lymphoma is also called diffuse small noncleaved-cell lymphoma. Adult T-cell leukemia/lymphoma. Adult T-cell leukemia/lymphoma is caused by the human T-cell leukemia virus type 1 (HTLV-1). Signs include bone and skin lesions, high blood calcium levels, and lymph nodes, spleen, and liver that are larger than normal. Mantle cell lymphoma. Mantle cell lymphoma is a type of B-cell non-Hodgkin lymphoma that usually occurs in middle-aged or older adults. It begins in the lymph nodes and spreads to the spleen, bone marrow, blood, and sometimes the esophagus, stomach, and intestines. Patients with mantle cell lymphoma have too much of a protein called cyclin-D1or a certain gene change in the lymphoma cells. In some patients who do not have signs or symptoms of lymphoma delaying the start of treatment does not affect the prognosis. Posttransplantation lymphoproliferative disorder. This disease occurs in patients who have had a heart, lung, liver, kidney, or pancreas transplant and need lifelong immunosuppressive therapy. Most posttransplant lymphoproliferative disorders affect the B cells and have Epstein-Barr virus in the cells. Lymphoproliferative disorders are often treated like cancer. True histiocytic lymphoma. This is a rare, very aggressive type of lymphoma. It is not known whether it begins in B cells or T cells. It does not respond well to treatment with standard chemotherapy. Primary effusion lymphoma. Primary effusion lymphoma begins in B cells that are found in an area where there is a large build-up of fluid, such as the areas between the lining of the lung and chest wall (pleural effusion), the sac around the heart and the heart (pericardial effusion), or in the abdominal cavity. There is usually no tumor that can be seen. This type of lymphoma often occurs in patients who have AIDS. Plasmablastic lymphoma. Plasmablastic lymphoma is a type of large B-cell non-Hodgkin lymphoma that is very aggressive. It is most often seen in patients with HIV infection. Age, gender, and a weakened immune system can affect the risk of adult non-Hodgkin lymphoma. Being older, male, or white. An inherited immune disorder (such as hypogammaglobulinemia or Wiskott-Aldrich syndrome). An autoimmune disease (such as rheumatoid arthritis, psoriasis, or Sjögren syndrome). Human T-lymphotrophic virus type I or Epstein-Barr virus infection. Taking immunosuppressant drugs after an organ transplant. Signs and symptoms of adult non-Hodgkin lymphoma include swelling in the lymph nodes, fever, night sweats, weight loss, and fatigue. Swelling in the lymph nodes in the neck, underarm, groin, or stomach. Pain in the chest, abdomen, or bones for no known reason. When fever, night sweats, and weight loss occur together, this group of symptoms is called B symptoms. Where the cancer forms in the body. Tests that examine the lymph system and other parts of the body are used to help detect (find) and diagnose adult non-Hodgkin lymphoma. Physical exam and history: An exam of the body to check general signs of health, including checking for signs of disease, such as lumps or anything else that seems unusual. A history of the patient’s health, including fever, night sweats, and weight loss, health habits, and past illnesses and treatments will also be taken. 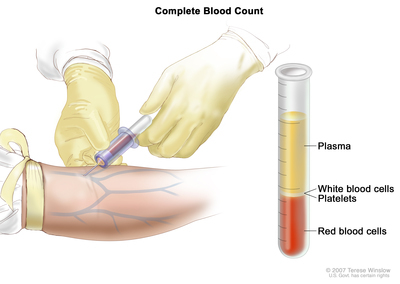 LDH test: A procedure in which a blood sample is checked to measure the amount of lactic dehydrogenase. An increased amount of LDH in the blood may be a sign of tissue damage, lymphoma, or other diseases. Hepatitis B and hepatitis C test: A procedure in which a sample of blood is checked to measure the amounts of hepatitis B virus-specific antigens and/or antibodies and the amounts of hepatitis C virus-specific antibodies. These antigens or antibodies are called markers. Different markers or combinations of markers are used to determine whether a patient has a hepatitis B or C infection, has had a prior infection or vaccination, or is susceptible to infection. HIV test: A test to measure the level of HIV antibodies in a sample of blood. Antibodies are made by the body when it is invaded by a foreign substance. A high level of HIV antibodies may mean the body has been infected with HIV. CT scan (CAT scan): A procedure that makes a series of detailed pictures of areas inside the body, such as the neck, chest, abdomen, pelvis, and lymph nodes, taken from different angles. The pictures are made by a computer linked to an x-ray machine. A dye may be injected into a vein or swallowed to help the organs or tissues show up more clearly. This procedure is also called computed tomography, computerized tomography, or computerized axial tomography. 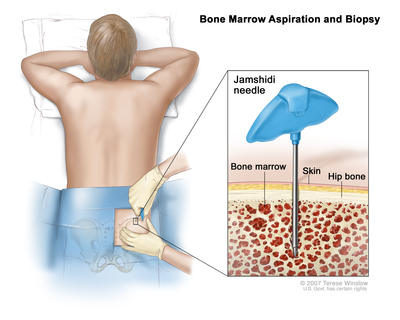 Bone marrow aspiration and biopsy: The removal of bone marrow and a small piece of bone by inserting a needle into the hipbone or breastbone. A pathologist views the bone marrow and bone under a microscope to look for signs of cancer. Core biopsy: The removal of part of a lymph node using a wide needle. FISH (fluorescence in situ hybridization): A laboratory test used to look at genes or chromosomes in cells and tissues. Pieces of DNA that contain a fluorescent dye are made in the laboratory and added to cells or tissues on a glass slide. When these pieces of DNA attach to certain genes or areas of chromosomes on the slide, they light up when viewed under a microscope with a special light. This type of test is used to look for certain genetic markers. Immunophenotyping: A process used to identify cells, based on the types of antigens or markers on the surface of the cell. This process is used to diagnose specific types of leukemia and lymphoma by comparing the cancer cells to normal cells of the immune system. Other tests and procedures may be done depending on the signs and symptoms seen and where the cancer forms in the body. The type of non-Hodgkin lymphoma. The amount of lactate dehydrogenase (LDH) in the blood. Whether there are certain changes in the genes. The patient’s age and general health. Whether the lymphoma has just been diagnosed or has recurred (come back). Which trimester of pregnancy the patient is in. Whether the baby can be delivered early. Some types of non-Hodgkin lymphoma spread more quickly than others do. Most non-Hodgkin lymphomas that occur during pregnancy are aggressive. Delaying treatment of aggressive lymphoma until after the baby is born may lessen the mother's chance of survival. Immediate treatment is often recommended, even during pregnancy.